Flooding is the most common environmental hazard worldwide. This is due to the vast geographical distribution of river floodplains and low-lying coastal areas. It is difficult to define exactly a flood is. It is largely classified as 'an overflowing of water onto normally dry land' . This encompasses the simple notion that a flood involves an excess of water compared with average water levels. Floods can be categorised as either river floods or coastal floods. River floods are often atmospherically driven, caused by excessive precipitation. They can also occur due to landslides falling into rivers, and by dam or levee failures. Coastal surges are often due to storm surges caused by tropical cyclones or tectonically produced tsunamis. There are many reasons why floods occur, these can be divided into categories of causes. These are flash floods, storm surge, and dam and levee failures. These types of flood occur with little or no warning. Flash floods can be deadly due to the rapid rise in water levels and the high flow-velocities of the water. There are factors which contribute to the occurrence of flash floods: rainfall intensity, duration, surface condition and topography. Urban areas are more susceptible to flash floods due to the lack of natural drainage systems and the high amounts of impervious surfaces (concrete, tarmac). These tend to increase the rate of run off into water systems. Storm surges inundate coastal margins due to severe onshore winds, often accompanied by low atmospheric pressure and sometimes high tides. Friction between moving air and the water creates drag. Depending on the distance over which this process occurs (fetch) and the velocity of the wind, water can pile up to depths of over 7 metres. Intense, low-pressure systems and hurricanes (tropical cyclones) often cause storm surges. Nine out of ten tropical cyclone fatalities are caused by the storm surge associated with the storm. Dam and levees may be designed to contain a flood at a location on a water way that has a certain probability of a flood occurring in a specific year, i.e. one in every 250 years. If the flood is larger than the one predicted the structure built to contain it will be overtopped and will fail. This causes a sudden burst of water which causes a flash flood downstream. Failed dams and levees can cause catastrophic floods due to the intensive energy involved in the sudden burst of water. River floodplains and coastal areas are the most susceptible to flooding, however, it is possible for flooding to occur in areas with unusually long periods of heavy rainfall. Bangladesh is the most flood prone area in the world. Bangladesh is vulnerable due to presence of a monsoon season which causes heavy rainfall. Other factors which have contributed to flooding are deforestation in Nepal which has caused soil erosion. This had lead to the increased silt content in the rivers further downstream. This decreases the carrying capacity of the rivers, causing the peak flow of the river to increase. Examples of the different types of floods can be found in the occurrence section. In April 1993 parts of the Midwest received as much as 10 times the normal amount of rainfall which swelled the Mississippi and its 50 tributaries. The tributaries fill when the Mississippi rises causing local floods of small to medium magnitudes. Due to the amount of water involved the tributaries were already inundated so the excess water in the Mississippi flooded 354 counties in 9 states. The water overwhelmed levees, erased towns and destroyed other infrastructures such as bridges and airports. 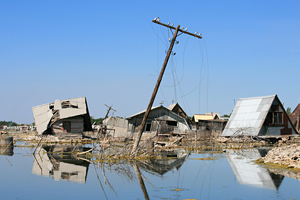 The flood killed 45 people, displaced 50,000 people and inundated 13.5 million acres of land. The Mississippi river had been altered and re-directed in the 1970s. Dams and levees were built to deal with the changes in the river capacity. Federal government built dams and levees stayed in tact during the 1993 flood, however, 70% of the constructions built by the private sector failed. In September 1900 a hurricane and subsequent storm surge hit the town of Galveston on the east coast of Texas. The 7ft storm surge is thought to have killed more than 6,000 people. In February 1953 a storm surge hit the coasts of the Netherlands and eastern England. It broke through coastal defences, inundating 324,000 hectares of land and killed more than 2,000 people. The reason the Netherlands was so vulnerable is because much of the Netherlands is below sea level. Construction of the Vaiont dam was completed in 1961. The dam was built across a tributary of the river Paive in the Alps of north-eastern Italy. The water behind the dam began to rise soon after construction. After two years it became clear that the rising waters were destabilising Mont Toc, causing the entire mountainside to slide towards the growing lake. During torrential rain on the 9th October 1963 the mountainside slid into the lake generating a huge wave which travelled down the Paive valley. The flood killed 2,000 people and destroyed the town of Longarone. Between July and October 1998 prolonged floods affected two thirds of the country at their worst and lasted two and half months. Environmental coincidences such as El Nino in 1997 and La Nina in 1998 caused an increased rainfall during the monsoon season in Bangladesh and in the catchment areas of the Ganges and Brahmaputra rivers in Nepal and India. The floods peaked on the 14th September, by then more than 1,500 people had died, 23 million people were homeless. The flooding was exacerbated by the construction of impermeable surfaces such as roads, bridges and homes that interfered with drainage patterns, increasing surface run off. Deforestation in Nepal is also thought to have had an affect on the extent of the flooding due to increased silt content in the river system, causing an increased amount of water to travel downstream. Hurricane Katrina is the most costly disaster in the USA, and one of the strongest storms to hit the USA in 100 years. It is thought to have killed 1,500 people, mainly in New Orleans. The storm surge associated with Hurricane Katrina reached around 8 metres on the Gulf coast. This was particularly important as the majority of New Orleans lies below sea level. The storm surges broke levees causing widespread flooding and an increase in the level of Lake Pontchartrain. Unfortunately the levees protecting New Orleans from Lake Pontchartrain could not cope with the added pressure of the extra water and subsequently broke. This caused 80% of New Orleans to become submerged in up to 6ft of water.